How long have you ignored the anwsers to these questions? The NOAA publications dealt with this "concern" YEARS ago. The simple determination is to compare the satellite data to the ground based data to see how they differ. Hint: they do not differ to any significant degree. Another improperly set up USHCN site. Man must of hit a nerve. And, thank you for reposting my information so the fence sitters can get another look at it. Once again number 5 of the NOAA guideline is violated. 1 foot away from concrete and asphalt. In the picture that is a Stevenson Screen. That was what was used before the MMTS system was put into use. Same rules of set up still apply, and those rules were completely violated. A picture is worth a thousand words. Just wait until I unleash the other facet of computer simulations? That's when things get really interesting. Fence sitters those here can whine about this all they want. These station photographs have clearly violated guidelines set up by NOAA. No doubt about it. I have provided a link that establishs that FACT!!! So, fence sitters what do you think will happen when you set up a temperature measuring station one foot away from asphalt? Concrete? AC exhaust ports? Parked cars? What will that do to the data set? Honest science? Last edited by Milton Banana on Thu Jan 09, 2014 2:03 am, edited 3 times in total. Fence sitters what you are witnessing is photographic evidence of scientific maleficence. And, I have just started. No, you have provided evidence of creep involving site locations, which WUWT beat like a drum until it was clear they were merely beating a dead horse. As I asked, have you compared the temperature trends from the ground stations, including these pictured to the satellite measurements to show us the impact of this "problem"? How about a comparison of the known sites as pictured to the known sites without the creep of construction? Science does not rely on guessing at what the effect will be on the dataset, science looks at the datasets to see what the effect has been through comparison. Where are your comparisons to show the impacts? Looking back to see when the new MMTS system was set up and it appears it replaced the previous system about 1990. So this means the MMTS "problem in the Marysville picture was only from 1990 onward. The temperature trend however started several decades prior to that. It started well prior to any cell phone towers, before air conditioning was common, it started even before paved parking lots were common outside of large urban centers. How do those facts correlate to the assumption of a bias causing the trend rather than there being an actual trend? Looking at the location of Marysville, elevation 62' in the Sacramento Valley and Susanville, elevation 4258', some 150 miles to the northeast in the mountains, it makes me wonder why anyone thought the two would be comparable in temperature. Elevation has nothing to do with it. Its the trend exhibited from a properly set up site versus one that in not set up properly. Standard red herring tactic. The classic urban sprawl argument. 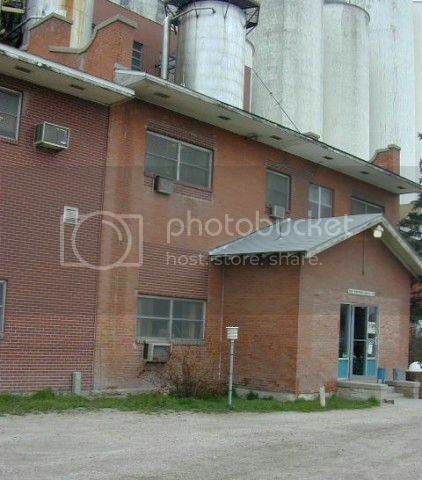 Well, my last example could be viewed that way since it involved an old Stevenson screen and newer construction. How about this one from Fort Morgan, Colorado. Clearly a newer MMTS unit placed in front of a building that is at least 50 years old. 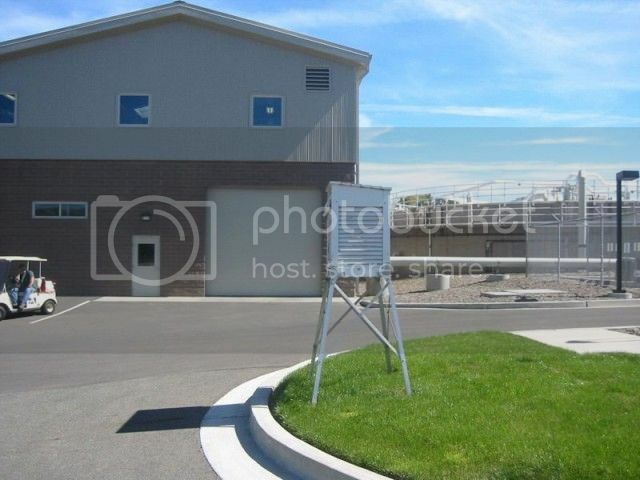 There is no way this building was built after this unit was installed. It was put there on purpose. This site violates 2, 4 and 5. And, has hot AC exhaust just three feet away. According to NOAA fence sitters. Please review the guidelines again. Now fence sitters. I have observed the quality of competition has fallen off lately. Obvious avenues of argument have been neglected here. Allow me to argue for the other side. This is really embarrassing for the opposition I know. The ground based temperature data sets are adjusted to prevent bias scientists say. An equation to adjust data sets are employed to ensure precise data from each and every site. No matter where they are located. No matter their surrounding. No matter their set up. Everything is okay. We have these things under control. Remember the new green is really the old red. This is the same argument offered for satellite measurements mentioned before. You see satellites are calibrated for specific temperature readings. The thing is as the orbit decays that calibration falls out of accuracy. Everything in orbit falls into decay. Instead of admitting we just spent billions of dollars for nothing we have an “equation” that fixes everything. So, an adjustment equation fixes every possible situation concerning a USHCN sites? To many variables. Not possible. They are lying for over 1000 sites. Not possible. Glad to help out opposition. Please try to do better. Honestly you are beginning to bore me. Elevation has nothing to do with it. You have some evidence of this? Other than your own claim? Its the trend exhibited from a properly set up site versus one that in not set up properly. I see an improperly set up site in at best the late 1980s caused a trend to start 50 years in the past? Can you explain just how that is accomplished in the real world? The MMTS system was established by 1991 and the MMTS shelter, which is clearly marked in the picture would not have been able to affect a trand earlier than that. 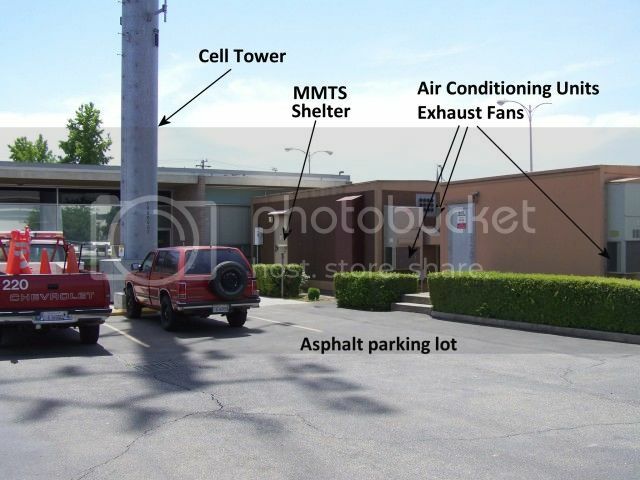 The same for the more recent cell tower, air conditioning systems, and paved lot. Standard red herring tactic. The classic urban sprawl argument. No a valid point against the claimof site location causing the trend exhibited for over 7 decades. Well, my last example could be viewed that way since it involved an old Stevenson screen and newer construction. How about this one from Fort Morgan, Colorado. How about it? What is the trend you wish to claim did not occur with this site? A disproportionate rise in temperature after 1990? How far back do these site records go? Perhaps the replacement unit was installed in the same location to prevent the potential bias of a shift in location. Or even better, when were these placement standards developed and implimented? Notice the first point mention is rare or gradual change in the collection of data to ensure conststency. General. This appendix describes the requirements and standards for meteorological sensors used in the aviation and synoptic observing programs staffed or overseen by the NWS. The standards are for sensor resolution, accuracy, siting and exposure. If standards can not be met by equipment in place, the standards should be achieved as stations are changed, equipment is installed, programs are modified, or new stations are established. 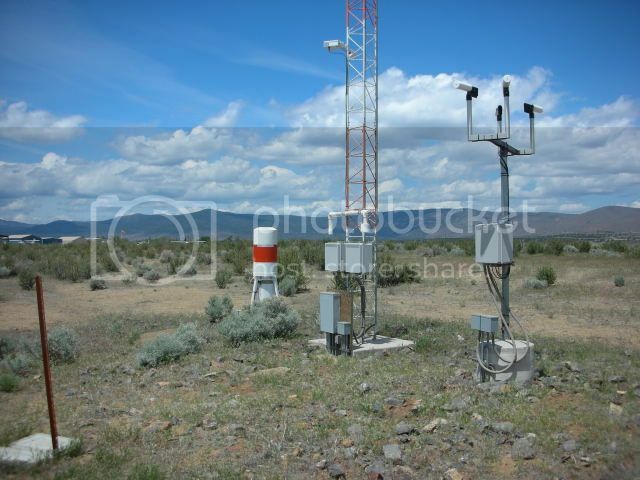 Siting and Exposure of Meteorological Sensors. Standards will be followed as closely as possible to ensure uniformity of observations. Siting and exposure standards define and establish requirements. The implementation of these should be flexible to achieve a balance between meteorological representativeness, space availability, and cost effectiveness. The NWS will follow the guidelines documented in the Federal Standard for Siting Meteorological Sensors at Airports (http://www.ofcm.gov/siting/text/a-cover.htm ). It is easy to become bored when you do not understand what is being discussed. It is also easy to become "bored" when you discover you do not understand what is being discussed and your argument shows it. I love the way you claim there are too many variables for adjustment based on your "expert" opinion and the actual experts are wrong because they want to lie to us ..... for nearly a century. Note the fact when predictions don't come to pass the statist, leftist. green movement quickly calls for a new definition of what ever its agenda is pushing for. Propaganda at its worst. Subterfuge, evasion, lying, attempting to control the language for outcome. Fence sitters is this open science? Is this what you come to think of as open, honest, and ethical approach to policy and science? This effects everyone. Choose wisely. Because you are choosing between freedom and tyranny. Once again proving you have to go outside the United States press for any hard hitting news stories. Der Spiegel gets an at-a boy for doing the right thing and representing freedom over what the current American press advocates. Its really sad what has happened to the American journalist. They have willingly submitted what it took the Soviet press to give up at the point of an AK-47. Disgusting. A true prediction is not couched as "could" but as a "will". What was it you said about "Subterfuge, evasion, lying, <sic> attempting to control the language for outcome"? Does the term hypocrisy ring a bell? How about the questions about your previous claims from which this post seems to be an attempt at deflection and diversion?